Historically, a big catalyst for the development of almost every major city around the world has been the proximity to water. Whether you’re talking about the Hudson, Thames, Han, Atlantic, Mediterranean, Pacific, Nile, Great Lakes, Erie Canal, or any other major waterway, it’s all the same. The benefits of bodies of water include reliable drinking water, irrigation for agriculture, transportation, energy, food, and other resources that have proven time and time again to separate global cities from ghost towns. Philadelphia is no different, having been situated at the convergence of the Delaware and Schuylkill Rivers. This area was originally inhabited by the Lenape natives before the Dutch built Fort Nassau along the Delaware River where Brooklawn, New Jersey currently lies. In 1681, William Penn was granted a charter for what would become the colony of Pennsylvania, and Penn subsequently purchased the lands from the Lenape in order to be on good terms with the natives and ensure peace for the colony. Penn named the city Philadelphia, pseudo-Greek for “love” and “brother,” hence the popular nickname, “The City of Brotherly Love.” The city’s location relative to the water, as well as its central location at the time of the colonies, made it an important place for government, trading, and shipping. While William Penn had originally designed the city in a grid pattern, not all of the streets maintained this organization, and parts of the city layout became overcrowded, especially near the Delaware River. Penn issued the Charter of 1701, officially establishing Philadelphia as a city right before leaving it for the last time. Soon after, it would be Benjamin Franklin who would transform and generally improve the city, helping to set up the colonies’ first library, fire protection system, and hospital. Many other firsts happened in Philly during the 1700s, including the US’s first Medical school, zoo, suspension bridge, stock exchange, and the first steam vessel. As everyone already knows, Franklin was also one of the founding fathers, helping to establish the United States as a sovereign nation by leading the Revolutionary War. Philadelphia was an important focus of activity during the War, being the site of many principle signings, events, and battles. The city briefly served as the US Capitol from 1790 to 1800 while The District of Columbia was being constructed. The 19th century brought many immigrants, mostly Irish and German, to the city’s port. These people were largely responsible for the 1835 Philadelphia General Strike, the first successful labor strike in North America. The strike was able to set the ten-hour work day for workers in the city. Diversity in the city grew as a result of the Great Famine as well as the Great Migration, which at times led to race riots as immigrants competed with blacks for employment. Political corruption lined the early 20th century, which was also known for a steep rise in both suburbanization, as well as the decline of industry and therefore, many middle class jobs. This trend began to reverse in the late 1970s during a period of many efforts to gentrify the city, an initiative of both public and private origin that continues today. Historic areas were renovated during this time as well, drawing a massive tourist industry to the city, which today, constitutes a $10 billion a year sector for Philly. Other areas of focus included University City, a major education and science development in the easternmost part of the city, as well as Center City, the designated downtown part of Philadelphia, home to Logan Square, Penn’s Landing, Chinatown, the Old City, and many historic sites. 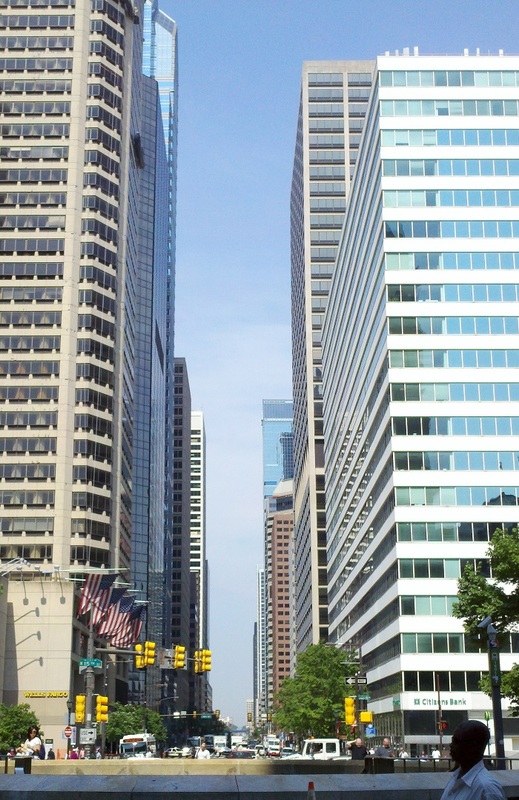 Center City is also home to the majority of the city’s modern skyscrapers, including Liberty Place. An office, retail, and hotel complex located just one block from City Hall, Liberty Place includes the One and Two Liberty Place standing at 945 and 848 feet tall respectively. Both heavily influenced by the Chrysler Building, the two buildings were the first proposal to break the longstanding “gentlemen’s agreement” not to build any structure in downtown higher than the statue of William Penn which is perched atop City Hall. The complex’s construction was a contentious issue among the public, fearing that breaking the agreement would open the floodgates to the construction of more tall skyscrapers, leading to the decline of Center City’s charm and livability. 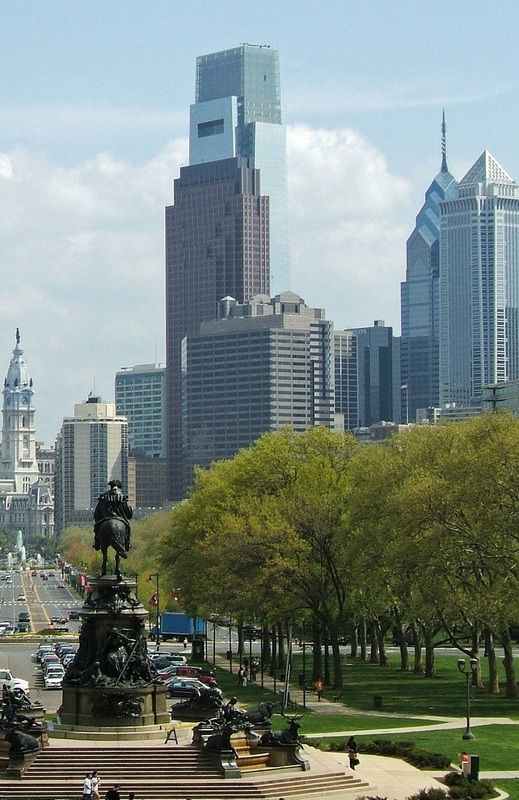 Up until the proposal, most of the city’s skyscrapers were flat top blocks just short of William Penn’s statue, a direct effect of the agreement which obscured the City Hall from the city’s skyline. After Liberty Place was completed, critics were very pleased with the results, stating that Philadelphia finally had once again, a definable skyline with unique features. The complex’s construction did in fact lead to more tall skyscrapers, but they have all generally been favored by the public. Perhaps more infamously however, the completion of One Liberty place in 1987 marked the beginning of the “Curse of Billy Penn” which would haunt Philadelphia Sports Teams for two decades. 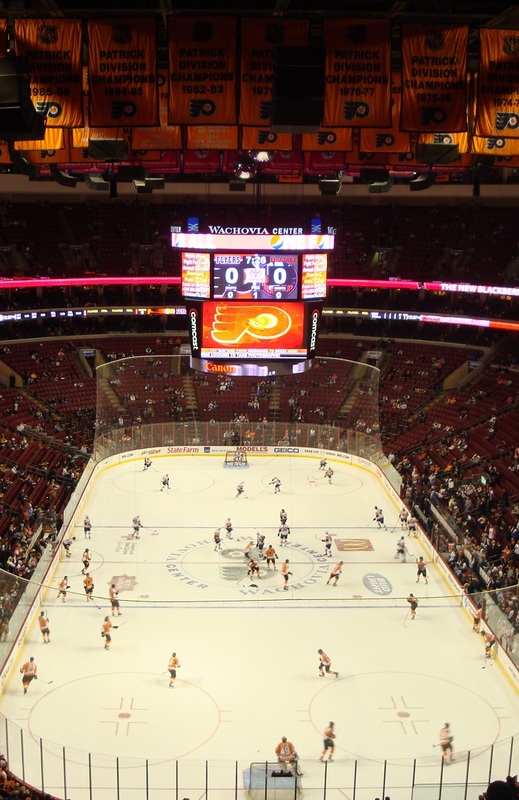 Philadelphia is one of twelve US cities with teams from the four major sports leagues, all of which had been enjoying a fairly impressive run of success in the years leading up to the completion of One Liberty Place. The MLB’s Phillies won the 1980 World Series as well as the 1983 NL Pennant. The NFL’s Eagles made an apperance at Superbowl XV in 1980. The NBA’s 76ers made the finals in ’77, ’80, ’82, and swept the 1983 NBA Finals. And the NHL’s Flyers won back to back Stanley Cups in 1974 and ’75, and appeared in the finals in ’76, ’80, ’85, and 1987. After One Liberty Place was officially opened, the city’s sports teams began a long streak of losing in championship games, including the ’87 and ’97 Stanely Cup Finals, the ’93 World Series, the ’01, ’02, and ’03 NFC Championships, as well as Super Bowl XXXIX in 2005. The “curse” was finally, and quite literally, lifted in 2007, when ironworkers helped raise the final beam in the construction of the Comcast Center, currently the city’s tallest building at 973 feet tall. Workers placed a 25″ statue of William Penn on the beam, where it remained atop the city, until it was stolen and subsequently replaced with a smaller statue. The Phillies would go on to win the 2008 World Series against the Tampa Bay Rays in five games, ending, and “proving” the curse. The Eagles won their first Super Bowl Championship in 2017 against the New England Patriots. Aside from sports, Philadelphia is known for its history based tourism industry, which revolves around famous sites like Independence Hall, the Liberty Bell, the homes of Edgar Allen Poe & Betsy Ross, the National Constitution Center, and many others. There are 67 National Historic Landmarks in the city, the third most of any city in the United States. 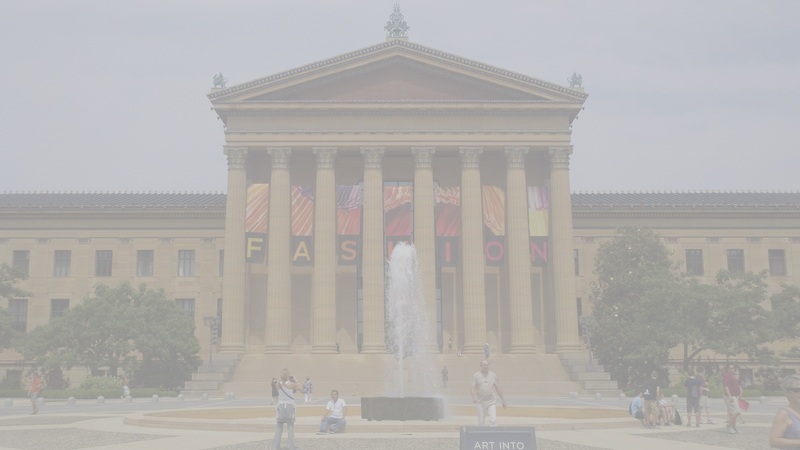 Philadelphia is also a major art center, anchored by the famous Philadelphia Museum of Art, whose 72 front steps were made famous themselves by the movie Rocky, to which there is a bronze statue placed just northeast of the steps in commemoration. 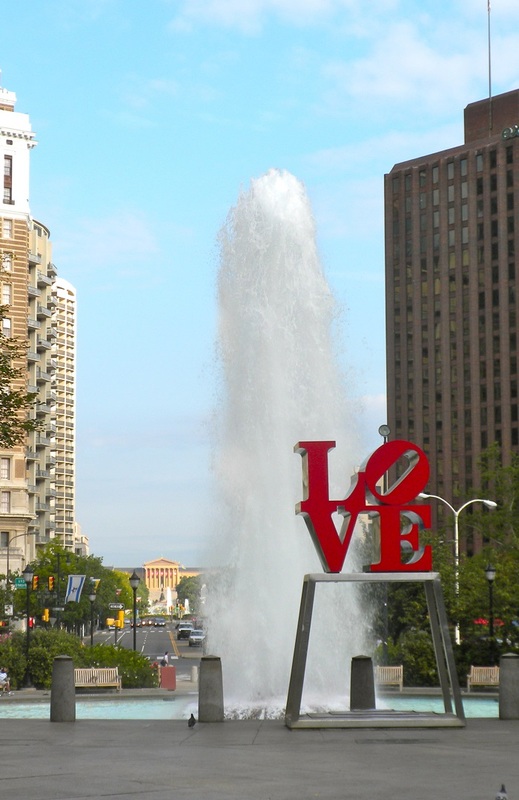 Philadelphia is home to more public art than any other American City, with more than 200 pieces being funded by the Philadelphia Office of Arts and Culture. Education also represents a major component of the city’s economy, with 300,000 students enrolled in the area’s colleges and universities, such as U Penn, the oldest univeristy in the country (as well as an Ivy League school), Saint Joseph’s University, Drexel, Temple, and Villanova. The city’s economy is largely driven by the science/tech, media, insurance, energy, and chemical sectors. Seven Fortune 1000 companies are headquartered in the city, including Comcast, the world‘s largest broadcasting and cable company by revenue. 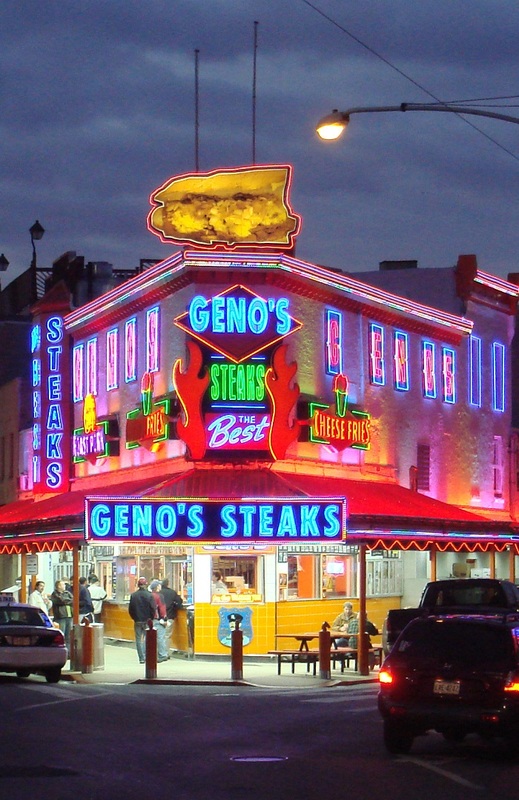 The city is known for its food as well, including water ice, Tastykake, hoagies, Wawa (a glorified gas station chain with food), soft pretzels (with New York City), and of course, cheesesteak, a product of German and Italian immigrants. In addition to its food, Philly is also home to many local and regional breweries, which distribute their product in some of the country’s best beer bars. Some of the more famous examples include Victory Brewing Company, Prism Brewing Company, Iron Hill Brewery, and Tired Hands Brewing. The commonwealth’s largest city generates an annual GMP of $347 billion, making it the seventh largest economy in the United States. 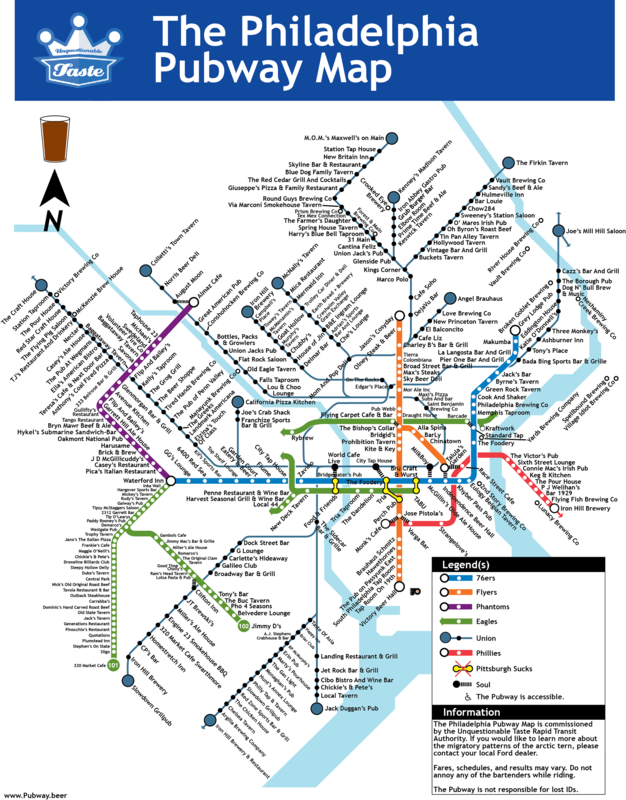 There are over six million people in the Greater Philadelphia Metro area, of which two thirds are served by the Southeastern Pennsylvania Transportation Authority (SEPTA), and its bus, subway, trolley bus, heavy commuter rail, and light rail systems. Along with the MBTA in Boston, SEPTA is one of only two public transportation networks that operate all of these five major types of tranist sytems. The system is also one of the oldest public transit networks in the country, with its light rail having first operated in 1906. SEPTA per se began operations in 1965, and is ranked as the fifth largest overall transit system in the country. Philadelphia currently ranks third among US Cities with 39.19% of its commuters taking public transport to and from work, behind only New York City and Jersey City. SEPTA’s light rail system is the fourth oldest in the country, and the sixth busiest by ridership, transporting just under 120,000 people each day across 8 lines, 68.4 miles of track, and more than 100 stations. SEPTA’s rapid transit system is also the sixth busiest in the country, carrying 342,600 people on the average weekday through 3 lines which account for 75 stations along 36.7 miles of track. The subway is unusual in that its track gauge is 5′ 2.5″, known as “Pennsylvania Trolley Gauge” (standard gauge is 4′ 8.5″). 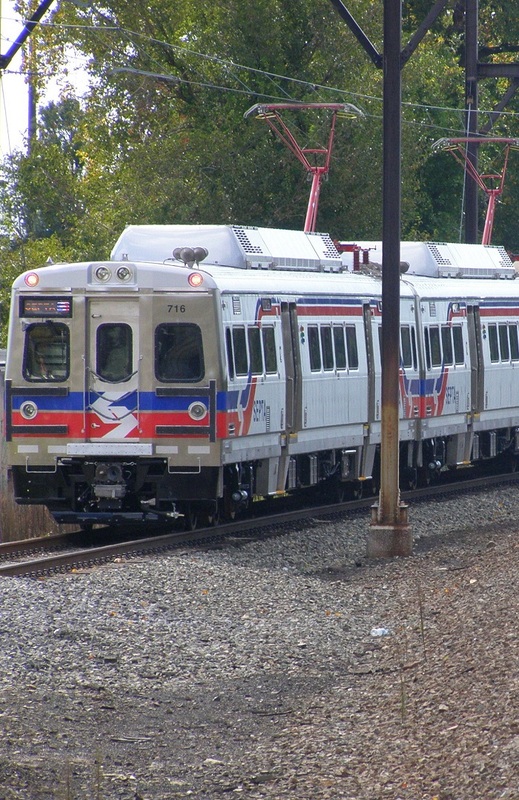 The SEPTA Regional Rail, the city’s commuter rail service, has an annual ridership of over 36 million passengers, and contains more than 150 stations on 13 branches. The Philadelphia Trolleybus system is the second longest lived trolleybus in the world, and only one of five systems currently operating in America. Including buses, trains, trolleys, and trolley buses, SEPTA controls 2,295 revenue vehicles and 196 routes around the Delaware Valley.